With the return of Spring comes the time for egg hunts, chocolate treats and other delights from a special bunny. Before and on Sunday, April 21 there will be tons of Easter celebrations in the greater Philadelphia region, including our list below. Share your favorite Easter events and memories with us on Twitter, Facebook and Instagram @Phillyfunguide! An Easter list would not be complete without mention of one of the city's most popular holiday events: the Annual Easter Promenade. 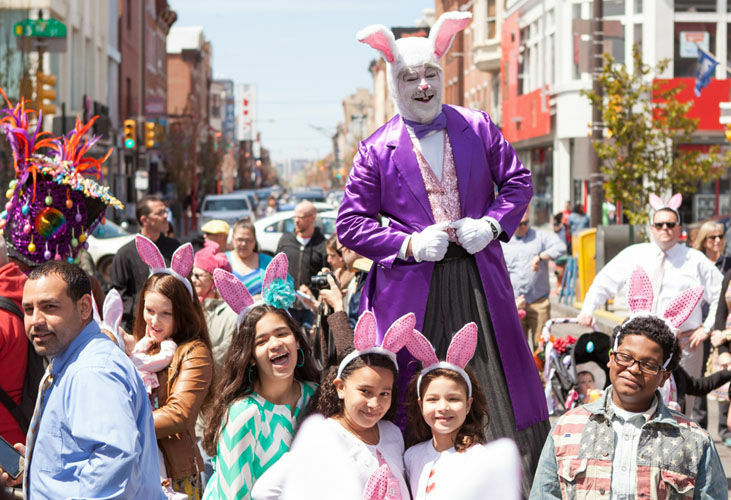 For the 88th year in a row, the annual festival and parade will make it's way down South Street (from Passyunk and South to Headhouse Square) to spead Easter cheer. For guests of all ages, the Promenade includes treats, live music, brunch, a costume contest and of course, a visit from the Easter Bunny himself. Put on your super spy hat for Morris Arboretum's High-Tech Egg Hunt! On Saturday, April 20, you and your family can get your James Bond on in this fun and innovative take on a traditional Easter egg hunt. Guests will need to use GPS, crack secret codes, and decipher riddles to find the hidden eggs in this family-friendly adventure. Sign up for Funsavers to save with 1/2-price tickets to family-friendly Philly events! Our list of Philly's best brunch spots and events! Celebrate science and technology throughout the Philly region with the 2019 Philadelphia Science Festival!